Ramon Ayala, 96, of Gardner, KS passed away Jan. 4, 2016 at his home. Mass of Christian Burial will be held 10:00 am Fri., Jan. 8, 2016 at Divine Mercy Catholic Church, 555 W. Main, Gardner, KS. Burial at 1:00 pm at Mount St. Mary’s Cemetery, 2201 Cleveland Ave., Kansas City, MO. Visitation 6:00 to 8:00 pm, Thur., Jan. 7, 2016 at Bruce Funeral Home, Gardner, KS. Memorial contributions may be made to Divine Mercy Church Building Fund, Compassionate Care Hospice, 10200 W. 75th St., Suite 100, Shawnee Mission, KS 66204 or Honor Flight KC. Ramon was born Nov. 11, 1919 in Juarez, Mexico, the third child of Jose Macedonio del Refugio and Domitila (Contreras) Ayala. He grew up in Clare, KS, which was a railroad town built for migrant workers to live in. Clare was a stopping point between Gardner and Olathe on the railroad bend. He went to school in a one-room schoolhouse in Clare, KS from first to the eighth grade and graduated from Gardner High School in 1938. 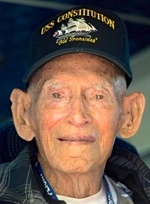 Ramon enlisted in the US Navy and was deployed to the Marshall Islands during WWII. He proudly served his country as Gunners Mate Third Class. Ramon received an honorable discharge at Norman, OK on Dec. 7, 1945. He flew to Washington DC on May 19, 2015 with Honor Flight KC. Ramon married Guadalupe Juarez on April 23, 1949 in Kansas City, MO. He worked in the printing and engraving industry his entire life; first for Cramer Chemical Company, and then for Intercollegiate Press. While working for Intercollegiate Press he developed an innovative way to engrave graduation cards and his idea was patented by the company. He was a member of Divine Mercy Parish in Gardner, KS. Ramon was a self-taught mandolin player and completed a class in amateur ham radio. He was an avid gardener who was well known for his abundant harvests. He will be dearly missed by family and friends. He was preceded in death by his parents Refugio and Domitila Ayala; his brothers, Cris and Cristobal Ayala; five sisters, Amelia Ayala, Jessie Velasquez, Maria Duffield, Lupe Jensen and Della Quijas and an infant son and infant great-grandson. Ramon is survived by his son, Raymond and wife Noel Ayala, Kansas City, MO; daughter, Helen and husband Marvin Wilson, Gardner, KS; grandsons, Bryan Wilson, Dennis and wife Amy Wilson, Dan and wife Lisa Wilson and Heather Wilson; five great-grandchildren, Sarah, Kelby, Emily, Cameron and Blake and many nieces and nephews and their families.